Children love to learn about the meaning of numbers through play. Each number is represented by its height. Put a 2 on top of a 3 and you have the same height as the 5. Put 3 fours together and it's the same height as a 10 and a 2. 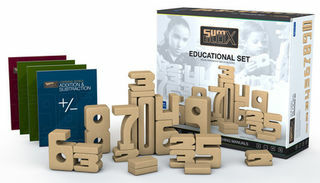 Sumblox can be used to show addition, subtraction, multiplication, division and even fractions.